pebblewriter: Deja Vu, All Over Again. Again. Here are the charts I've developed that show just how similar they are, and what I think they tell us about the next month or so. That's a whole lotta intersecting going on. 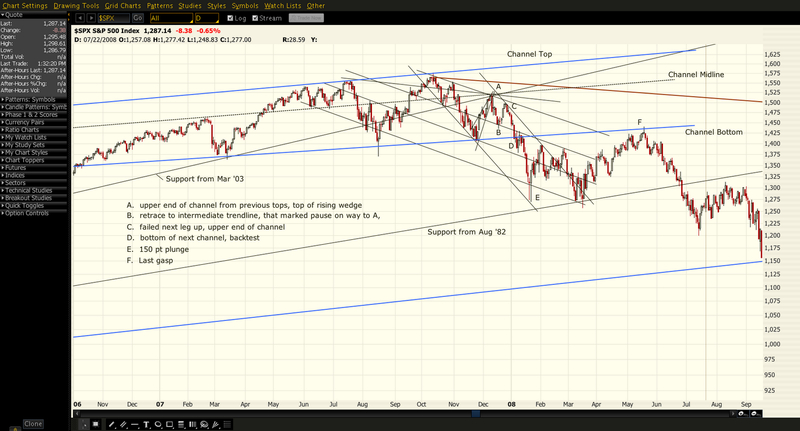 It fell back to B, which marked the same trend line that paused the market on its way to A, then rebounded. It stopped at C, also along the same trend line mentioned above (4). At this point, the market falls sharply back to the bottom of the channel, hangs around and backtests for a few days before dropping nearly 200 points in 5 days. It immediately tries (in vain) to recover and backtest the channel bottom, spending months before finally giving up and heading south for good. Now, let's look at the current market. 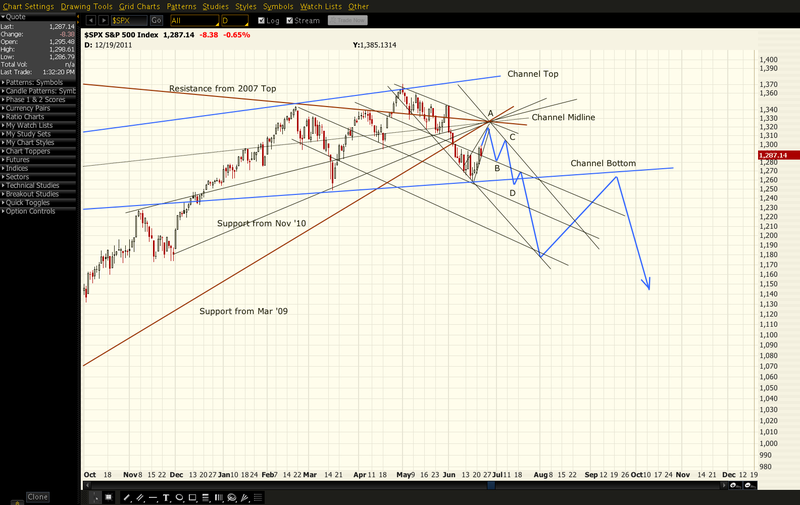 Pay particular attention to the intersection of all those trend lines at Point A. They're all there: the long term support from March '09, the medium term support from Nov '10, the trend line from the recent highs, the fan line from the next most recent high, the midline of the channel. While there's no guarantee the rest of the pattern will play out as it did in 2007, I think it's highly likely. My charting program isn't precise enough to pinpoint an exact top, but I'm thinking anywhere from 1320 to 1330 -- which just so happens to match the harmonics indicators. It's worth noting that if the pattern unfolds as I expect, we'll have formed a massive H&S pattern dating back to last December. While a little lopsided, it would indicate a drop to 1130 or so. There are numerous, other harmonic patterns that would come into play, but those can be dealt with in future posts. BTW, if the entire move down from 1370 to 1258 were counted as [i], this corrective wave would be [ii]. I favor that count over [iv] since, as I understand it, a rise beyond 1311 would violate EW rules of [i] and [iv] overlapping. I'm no EW expert, but I believe the 2007 count unfolded similarly. I'm looking for a very sharp move up -- possibly even by Friday. VIX should plunge to 15 or less as investors incorrectly assume that the bull is back. Optimism should be at a fever pitch and bears thoroughly demoralized before we commence wave [iii] of P, which should see prices below 1100 by year end. I'll just say wow. Thanks for the analysis. Looks like we've got the spike in VIX that should enable the new right shoulder to develop. I still think Pebble's scenario is plausible - this overnight drop, while scary, remains within a 78.6% retrace and looks like an ABC correction where A=C. I bought the dip at 1261 ES. Here is a chart. Check out the updated VIX and SPX H&S patterns on the intra-day post. If this decline -- entirely attributable to the bone-headed strategic oil reserve decision, IMHO -- arrests anywhere north of 1280, it'll leave a bullish hammer that even die hard bears can't ignore. Should easily take us back to 1300, completing the IHS that indicates 1328. Check out the RSI, MACD and histo on the hourly charts.